The number of steakhouses in Las Vegas overshadows the number of any other type of restaurants in the city (with the exception maybe of Italian restaurants. Therefore, I was very picky when creating this list of the best ones! But rejoice, dear carnivores, you are in luck in the Sin City - in these steakhouses you will be treated to delicious lunches and dinners, worthy of a royal banquet, and pampered respectively! 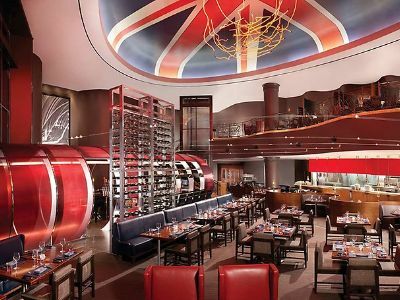 If you are a fan of the larger-than-life TV Chef personality Gordon Ramsay, a visit to his Las Vegas Steakhouse is a must. Gordon Ramsay Steak is known for its famous hit dishes that are plated to perfection. Located inside the Las Vegas Paris Hotel, the restaurant brings a boisterous vibe of London to glitzy Vegas. The setting is chic with ceilings that flutter the Union Jack flag. For trend setters, there is a private dining room or a choice to sit at the Chef’s table and watch meals being prepared. A classy bar and lounge offer a place to unwind before your meal. The menu tempts with classic British favourites like Beef Wellington and Shepherd’s Pie. Ramsay is a master of prime beef cuts, perfectly aged, and a massive steak smothered in his unique house sauce is a must. Wash it down with an exotic handcrafted cocktail and end your meal with the legendary sticky toffee pudding. Are you looking for a great steak on the Strip? 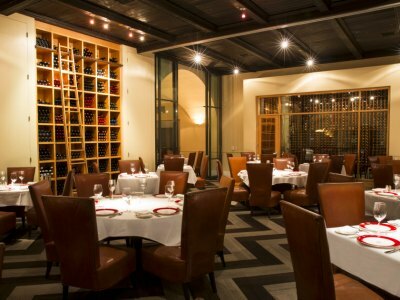 Tom Colicchio’s Craftsteak is the Las Vegas steakhouse of choice, perfect for a meal with a group of friends. Located inside the MGM Grand Las Vegas Hotel and Casino, it offers a classy ambiance of dark, polished wood with soft amber lighting and a laid-back mood. It boasts a AAA Four Diamond rating. Open for dinner, the menu focuses on the use of quality ingredients that are sourced from small family-run farms, artisanal producers and local fisherman. Each dish is prepared to capture and hero the true flavour of the main ingredient. For starters, patrons rave about the Caesar Salad with pickled white anchovies or the Roasted Baby Beets Salad with herbs and pickled eggs. For mains, dry aged steaks are at the forefront of the choice, but you can also indulge in fresh salmon, veal and freshly-caught lobster. Pair with an exclusive choice of award-winning wines from the cellar. 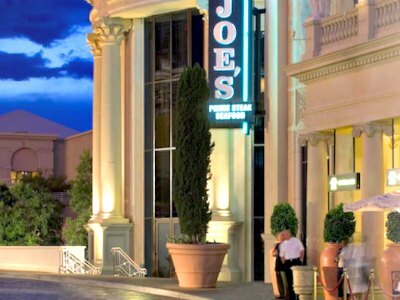 If you are in the mood for tasting the iconic Florida Stone Crab, then Joes Seafood Prime Steak & Stone Crab Las Vegas Steakhouse is the restaurant to book for a great experience. Located in the Forum Shops at Caesars, this high-class Surf-n-Turf venue offers exquisite dishes, ideal for a family meal. Joe’s goes back to 1913 when the original ‘Joe’ and his wife set up tables on their seaside porch and served up delectable Stone Crab. The ambiance is casual-elegant, open for lunch and dinner. Learning the correct way to crack a Stone Crab is a must and Joe’s will show you how. Tempted by a prime cut aged steak? The menu offers a mouth-watering choice with the Marinated Skirt Steak with Shishito Peppers and Lime Butter being a winner. Side with Jennie’s Mashed Potatos or Hashed Browns. For a relaxed vibe, chill out at the bar and try the Char-Broiled Beef Tenderloin Sandwich with Horseradish, Arugula and Crispy Onions Strings. Are you looking for a decadent steak smothered in Brazilian style Sauce, Surf-n-Turf and a huge choice of fabulous side dishes? The Pampas Churrascaria Brazilian Grille is the Las Vegas Steakhouse to head for. Located on the strip in the Planet Hollywood Casino Resort, you need to come hungry to this all-you-can-eat (AYCE) restaurant. It is open for lunch and dinner and also offers a brunch option, great for those who sleep late after a hectic Vegas night. The décor setting offers loads of wood and concrete and a bustling, vibrant atmosphere. There are 14 different types of meats and a 30 item side bar. Sit back and taste them all as an array of sizzling skewers are brought to your table in an authentic Rodizio experience. Pair with homemade salads, feijoada, mashed potatoes, fresh vegetables, fried bananas and baked pao de quiojo. If you prefer seafood, the large gulf shrimp braised with garlic, lime & Cajun seasoning is delicious. Wash it down with a hand-shaken Pina Colada. Wanting to have a special celebration in classic grand American Las Vegas Steakhouse style? Chef Emeril Lagasse at Delmonico Steakhouse is ready to welcome you. Located at the Grand Canal Shoppes inside the Venetian Resort Hotel Casino, this vibrant venue takes its name from the legendary, century-old New Orleans Delmonico Restaurant and Bar. Dress is smart-casual and the vibe is classy with tones of brown and crisp white table cloths. A massive wine wall with unique climbing ladder dominates the view. Serving lunch and dinner, this Creole-inspired cuisine offers a huge choice of appetizers, entrées, sides, mains and desserts. Try the hand-cut dry-aged Ribeye or the Filet Mignon, sourced from naturally raised Angus stock. Enjoy a Red King Crab with grilled asparagus or Emeril's famous BBQ Salmon. Delicious sides include Sautéed Garlic Mushrooms, Charred Brussel Sprouts and Creamed Corn Gratinée. End off your meal with the famously decadent Emeril's Banana Cream Pie drenched in caramel sauce, chocolate shavings and whipped cream. 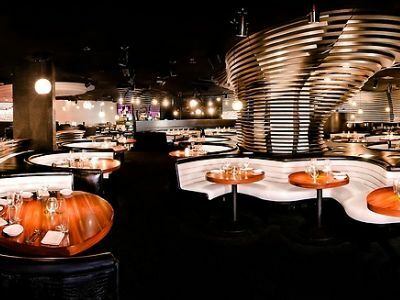 STK Las Vegas is a hip-and-happening modern restaurant with a stylish vibe, ideal for the trend setters to mix, mingle, see and be-seen. Located at the Cosmopolitan, this Las Vegas Steakhouse will have you eating, drinking and enjoying a blast until the late hours. The décor setting is ultra-cool, with pitch black ceiling and floors and circular white benches that enclose intimate tables. Cutting-edge lighting effects take your breath away with swirling formations that reach from the floor to the ceiling and change colors. Serving dinner only, this trendy venue has a bustling bar where you can meet your friends, order an exotic cocktail and get into the seductive mood, set by the live DJ. Then, dive right in and try the large Bone-In 34oz Ribeye smothered in Blue Butter Sauce. If you prefer a salad, the garden-fresh Kale Salad is a top choice with organic red quinoa, cranberries and apples. The Raw Bar offers Oysters, Ceviche and Caviar and sides range from classic Mac and Cheese to spicy Jalapeño Cheddar Grits. Are you a steak connoisseur looking for a super chic, award-winning venue to see and be-seen? 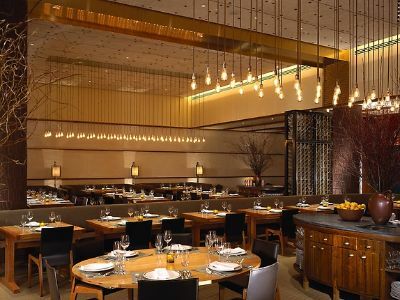 The CUT by Wolfgang Puck is the establishment you want – make sure to book – it is a highly coveted dining reservation. Located at the Palazzo, at Grand Canal Shoppes, this stylish restaurant wows with polished wood and unique shimmering square glass lighting accents. CUT delivers exquisite innovation and a fine-dining experience that offers a contemporary twist on the classic steakhouse. Entrées include exotic choices like whole roasted Stonington Maine Lobster with black truffle sabayon. Prime cut steaks are wet-aged or dry-aged to suit your taste. Accompanying sides feature the popular Soft Polenta with Parmesan and the delicious Creamed Spinach with fried organic egg. Wine connoisseurs will be delighted with a choice of over 500 wines to pair with your meal. If you only have time to visit one Las Vegas Steakhouse, CUT must be it. Looking for a breathtaking view of the Las Vegas neon city skyline while dining with friends and family? The stunning Top of the World is the venue of choice. The restaurant is set 800 feet above the famous Strip and revolves 360 degrees every 80 minutes offering panoramic vistas. 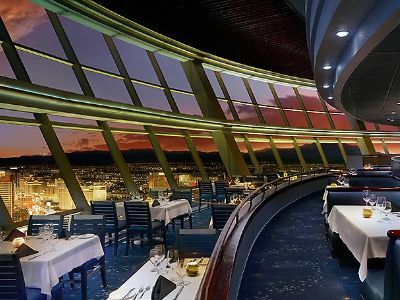 Located in the Stratosphere Casino, Hotel & Tower, Top of the World is one of the most unique restaurants on the planet. The ambiance of the glass-encased venue is smart and glitzy, offering a lunch, dinner and drinks menu. Starter specialities include a Shellfish Tower, Classic California Salad and a half dozen Market Oysters. For mains, try the Cape Grim Grass Fed Ribeye or the melt-in-the-mouth Harris Ranch Filet Mignon. Sides will delight with a Creamed Sweet Corn, a Sautéed Broccolini or Roasted Organic Mushrooms. Surf lovers can try the pan seared Chilean Seabass or a delectable 2.5lb Maine Lobster Thermidor. Signature cocktails will get the conversation going with names like Mango Maggie, Bada Bing, Spiced Sunrise and Grin and Pear It! Looking for a perfect filet in a sophisticated fine-dining setting rather than a noisy traditional Steakhouse? 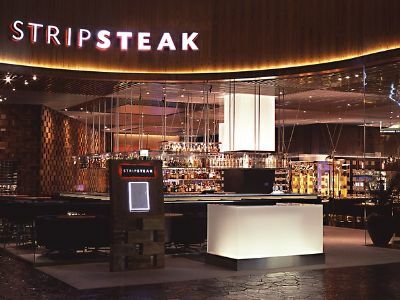 Stripsteak by Chef Michael Mina sets the scene for you. 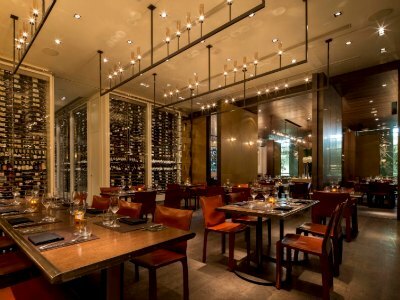 Located at Mandalay Bay, this Las Vegas Steakhouse offers a unique dining experience in a modern and classy setting with loads of wood, wide comfortable chairs and a show-stopping wine wall with colored lighting effects. Medium rare is the way to go with Certified corn-fed Angus Beef and American Wagyu Beef. The restaurant features wood-burning grills and circulating, slow-poaching chambers, a cooking method that enhances tenderness and maximises flavour at a low temperature. Open for dinner, you can choose to start with the Raw Bar and sample Salmon Toro and West Coast Oysters. For mains, the Colorado lamb with morel mushrooms, English peas and crisp polenta is a dream. From the grill, choose an 18oz Bone-In Ribeye or a smaller 8oz Filet Mignon. Smother in Foie Gras Butter or Bleu Cheese Crumbles. Finish off with home made ice-cream drenched in chocolate sauce. 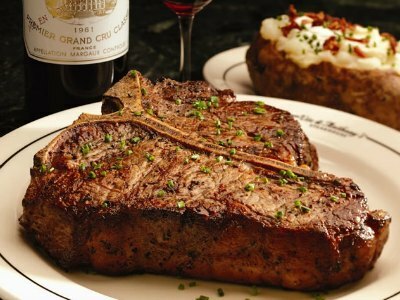 One of the best steakhouses in Las Vegas, Vic & Anthony's is a carnivore's paradise! It offers steaks for all tastes, and plenty of seafood choices. Located inside one of the best hotels in downtown - Golden Nugget, this steakhouse offers a calm atmosphere - a great break from the madness of the city. The decor is quite nice, a bit home-like with dark wood decorations and dark chairs. 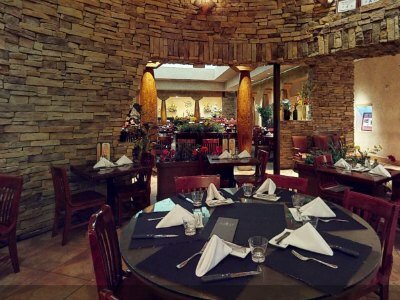 Among the most popular dishes at Vic & Anthony's are Filet Mignon, Oysters Rockefeller, Crab Cakes,Ribeye With Herb Butter, Tuna Tartare, Shrimp Cocktail, Lobster Bisque, Porterhouse Steak. Other than main dishes, they offer huge portions of side dishes that are great for sharing.